Sunday’s game was a 1:05 PM start. 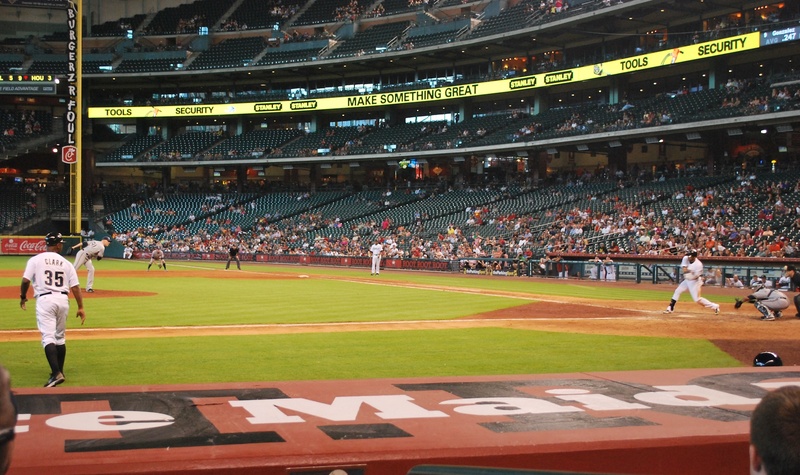 I left Annie’s at 11:45 and walked to Minute Maid Park. I got my ticket and was inside by 12:15. 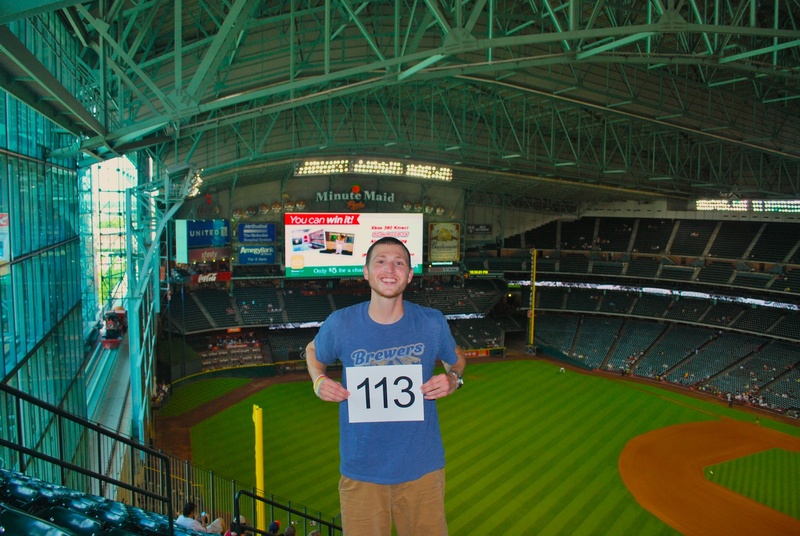 I went to the upper deck, this time to the left field corner, to get game photo number 113. I had an Astros fan help me out and she was very patient in taking 6 pictures until I was satisfied. 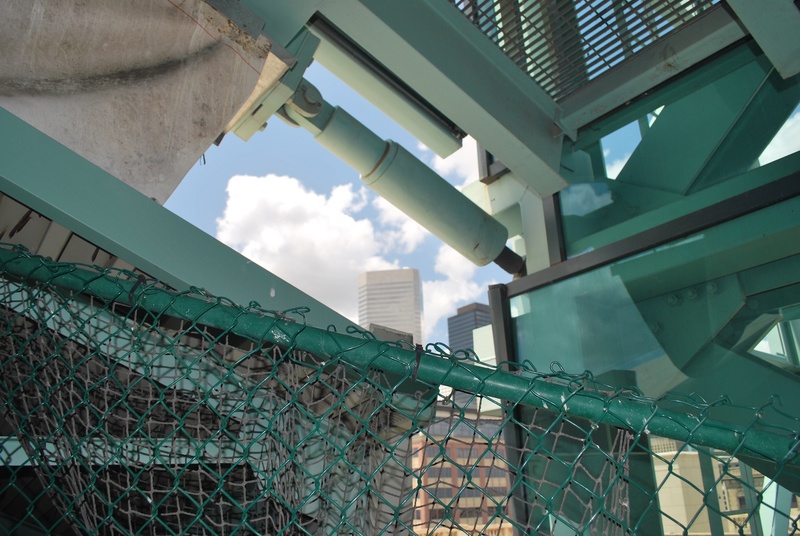 When I was up in the left field corner of the stadium I noticed that it’s not sealed very well. There’s also a decent gap between the sliding glass panels that are pictured on the left in the photo above. I know you can’t seal it completely because of the moving parts but you’d think they could do a little better job, especially since they use a lot of energy to keep the place cool and comfortable. I got my lemonade in the upper deck and made my way down to the field level for the start of the game. 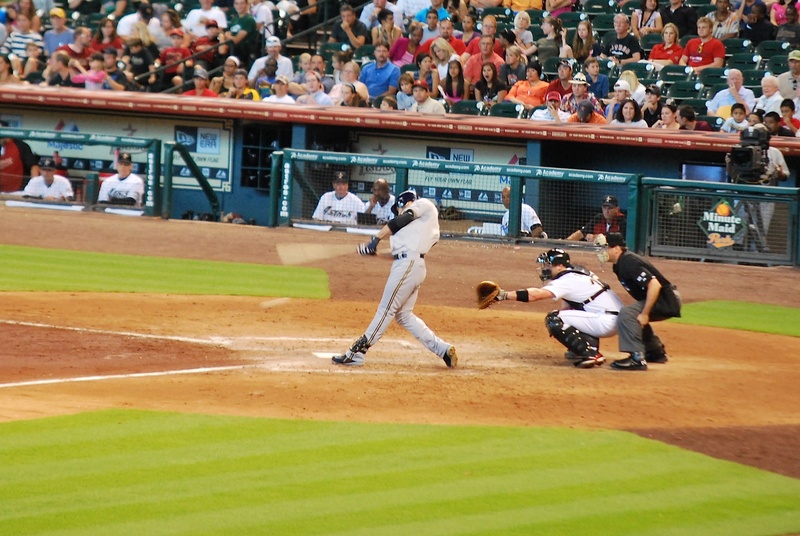 The Astros got off to a great start; hitting back-to-back doubles to take a 1-0 lead in the bottom of the 1st inning. In the top of the second Yovani Gallardo helped his own cause, singling in Carlos Gomez to tie the game at one. 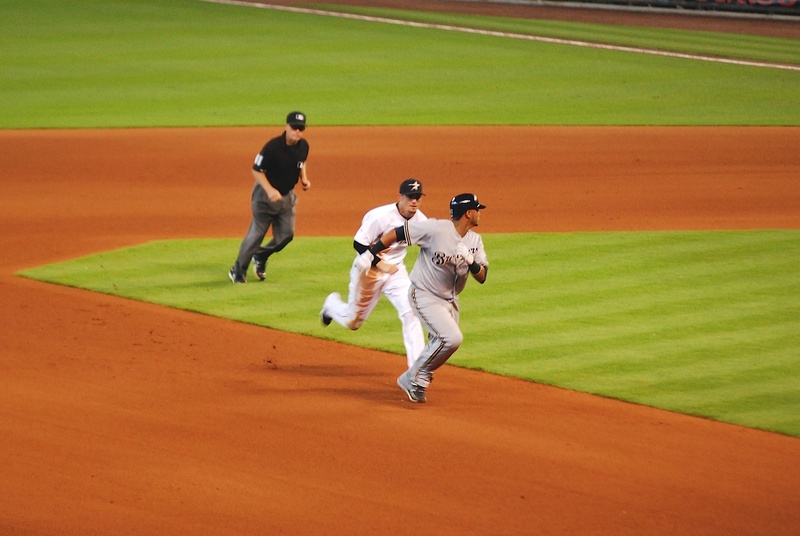 In the 5th Rickie Weeks drove in Segura on a ground ball to the third baseman. 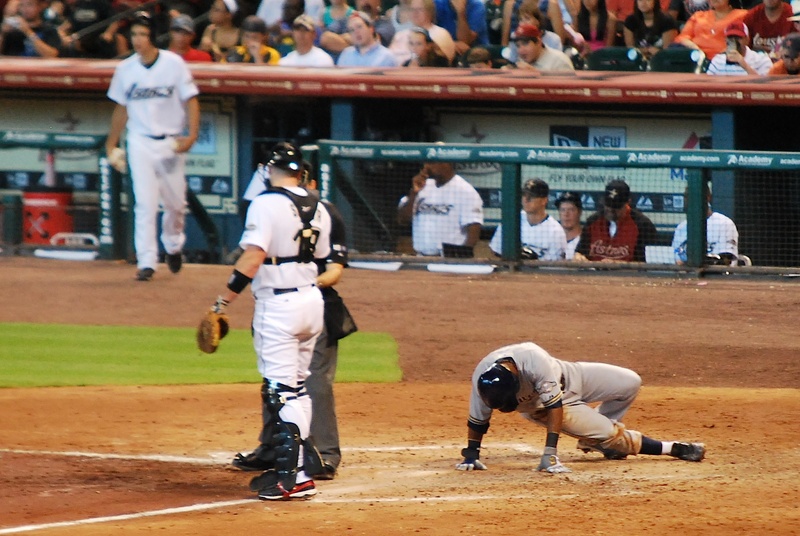 Segura was slow getting up and I was a little nervous (he was fine). The next hitter was Ryan Braun and he grounded out to short, allowing Aoki to score in the process. Brewers lead 3-1. 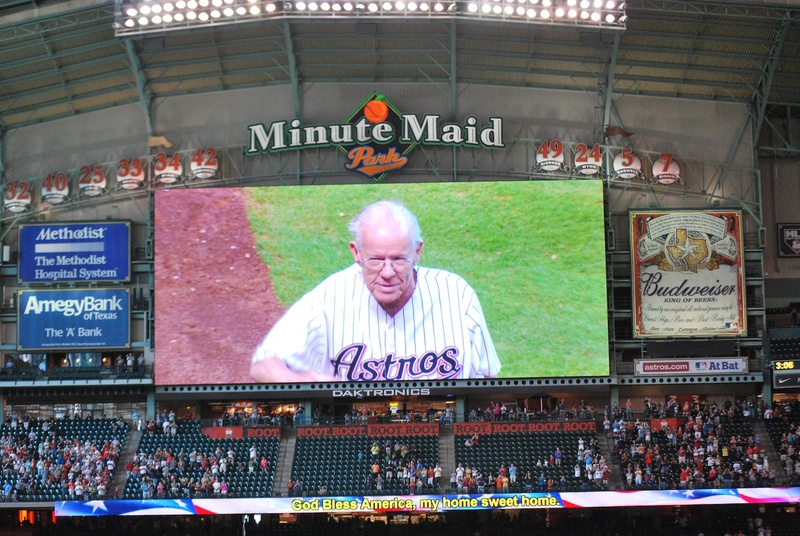 During the 7th inning stretch a 94-year-old man sang “God Bless America” and did a great job. I’m not the best at judging how old people are but I wouldn’t have guessed this guy was 94 years old. Gallardo pitched into the 8th but after giving up an RBI single with two outs he was removed and Veras got the final out of the inning. 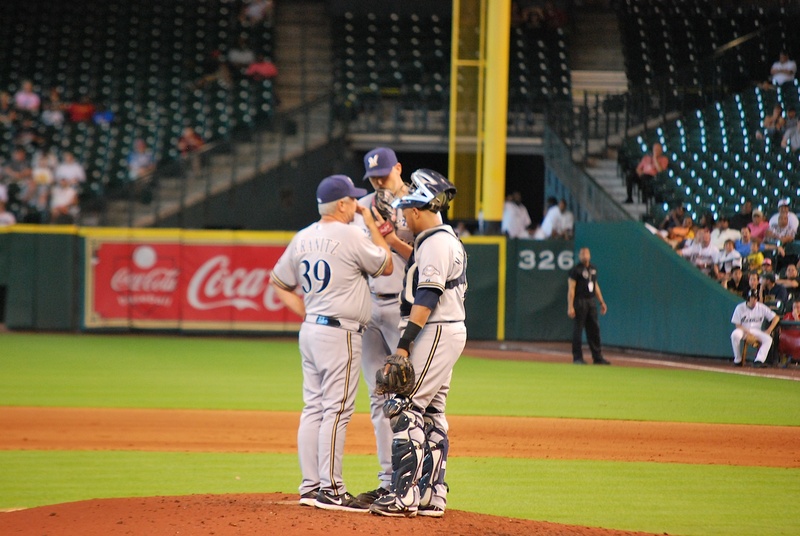 In the 9th inning Roenicke had Kameron Loe come in to try and get the save. 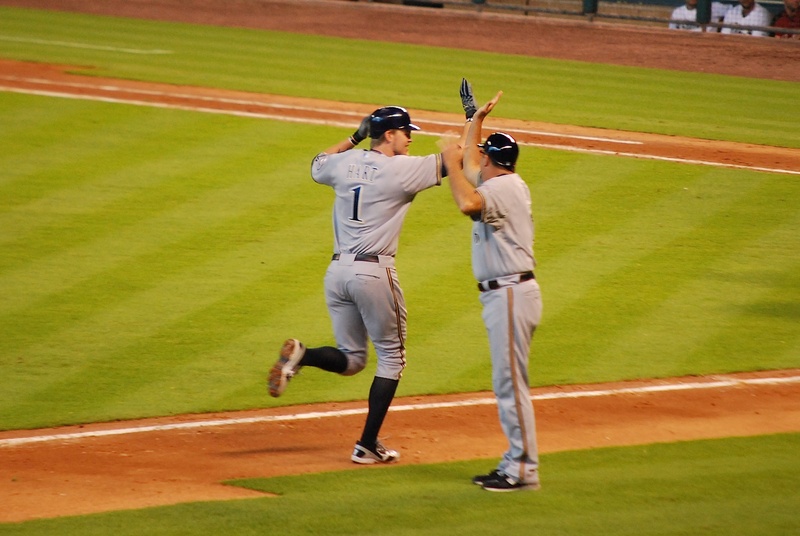 A leadoff single and a strikeout preceded a mound visit from pitching coach Rick Kranitz. Gonzalez grounded out to Ramirez and the Brewers avoided the sweep and stopped the 11-game road losing streak. 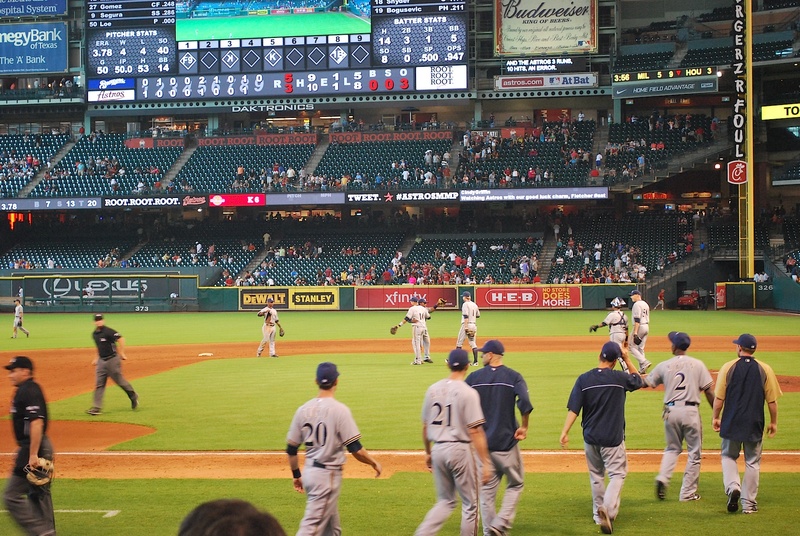 Final Score: Brewers 5 – Astros 3. In the 1st inning a man stopped by and asked if I was Ben. I said yes and he introduced himself as Tommy. He said he lives in Dallas and drove down to the game hoping to run into me. He said he saw my story on MLB.com and has been following along ever since. He handed over an envelope and said it was a donation for Be The Match. When I got back to Annie’s place I opened it and found a $100 check made out to Be The Match. Thank you Tommy!!! Tommy had his right leg amputated back in 1981. His car had run out of gas and when he returned with a gas can he was pinned between his car and a hit and run artist’s. 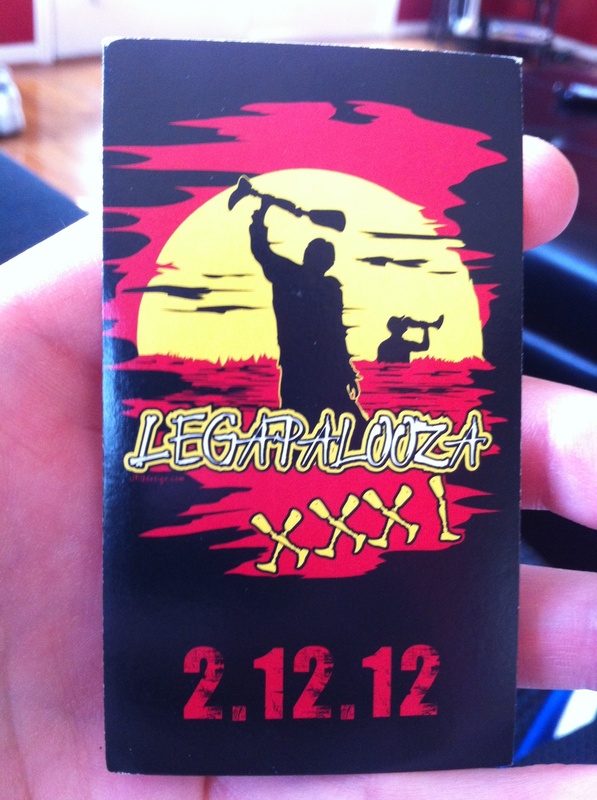 He now raises money for the Dallas Amputee Network through an event he has dubbed Legapalooza. You can click here if you want to read more about his story and his cause. I took a picture of the card he gave me and the XXXI is for the number of years since the accident and subsequent amputation. 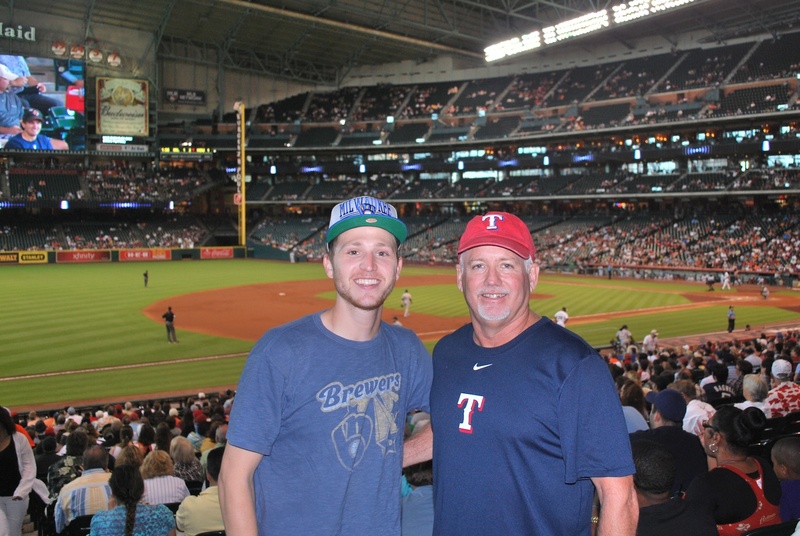 Tommy is also an enormous baseball fan and was at the Rangers game on Saturday night before making the trip down to Houston. He brought along a couple of books that he had made which contain pictures of him at 44 of the 45 major league parks he has visited over the years. Before we parted ways I had his friend K.C. take a picture of the two of us. After the game I was in the mood for barbecue and used google maps on my phone to find a place. I walked to where google *thinks* an Otto’s BBQ is located. Guess what? It’s not there. I looked online just now and the actual location is 20 miles southwest of downtown Houston; thanks Google! I asked a few people near the phantom Otto’s and they recommended Pappas Bar-B-Q. I walked even more out of the way to get to Pappas Bar-B-Q only to learn that they are closed on Saturdays and Sundays. Awesome. I was now almost two miles from Annie’s place. On the way back I stopped at Subway, which is not quite barbecue. Ok, it’s not even close. 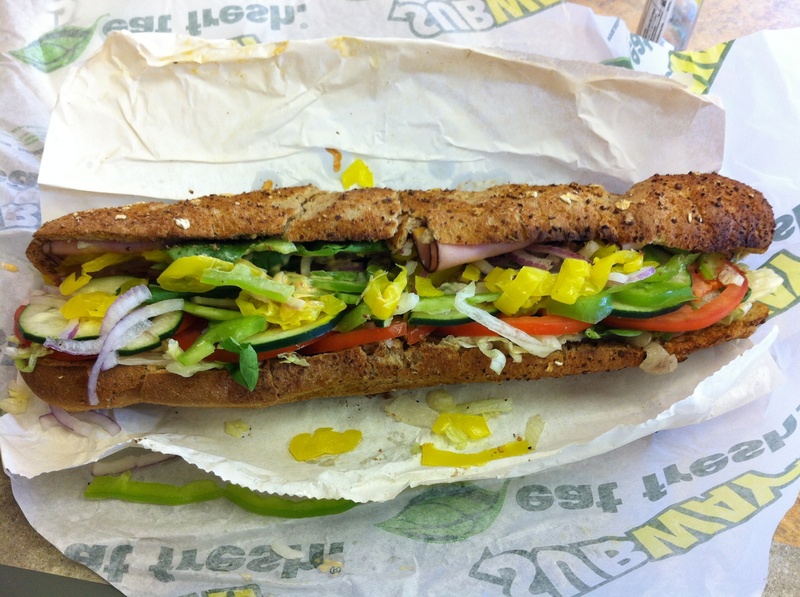 I always get my money’s worth at Subway and have them pile on almost every vegetable they have. A friend of mine, who shall remain nameless, gets ham and cheese subs when he goes, with no vegetables whatsoever. HA! That’s what I’m talking about. After I finished my sub I started walking back to Annie’s place. My knee was getting pretty sore so I paid the $1.25, jumped on the train that runs down main street, and rode it three stops. It only saved me .9 miles of walking, but every little bit helps. Seeing that I paid $10 for a 1.6 mile cab ride the night before it was a no-brainer. My flight leaves at 12:15 PM from Houston Hobby Airport tomorrow afternoon and I’ll be in Denver by 2:00. How about a road winning streak? I vote yes. Do you know if there’s somewhere online to see all of those pictures of him at the ballparks? I’m so jealous of people that got to all the ones that have closed in the past 15 or so years knowing how long it’ll be until a new batch of parks open up. I don’t think he has anything online. Yeah, I’m bummed about not getting to a few old ones, Yankee Stadium in particular. Some of the cookie cutter stadiums (old Busch, Veterans, Three Rivers) I’m not too upset about because they were all really similar.